California has taken on the task of figuring out how to power a major economy without fossil fuels. 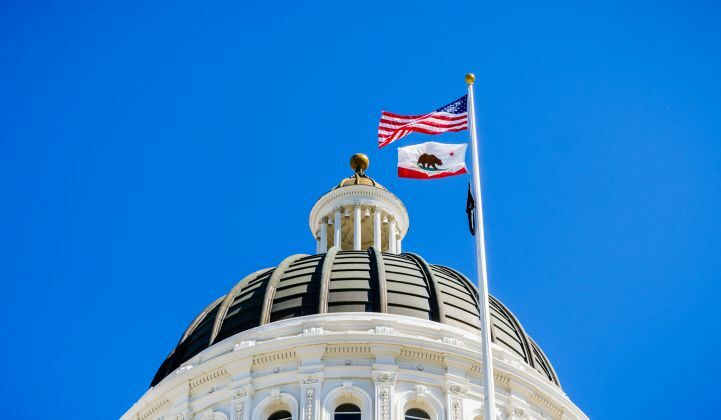 The California State Assembly passed a historic bill Tuesday to decarbonize is electricity system, putting clean energy advocates one procedural vote away from a major victory. The Senate already passed the bill last year, 25 to 13. The Assembly version now heads back to the Senate for final approval, before heading to Governor Jerry Brown's desk. The Senate has until the legislative session closes on Friday to hold the vote. SB 100, authored by outgoing State Senator Kevin de León, raises California’s renewable energy target to 60 percent by 2030 with interim targets, and gives the state until 2045 to generate the rest of its electricity from carbon free sources. Sources closely following the progress of SB 100 expect the bill to become law. They note there are only minor changes to the bill that the Senate previously passed during this two-year legislative session. SB 100 is distinct from similar legislation passed in Hawaii, which requires 100 percent renewable energy by 2045. California has leeway to pursue resources beyond just wind and solar, although it is not yet clear which, if any, the state will incorporate. Hawaii, with fewer than 1.5 million residents, represents a special case among states, because it is entirely disconnected from the mainland grid and must import conventional fuels at great expense. California, on the other hand, hosts a population of nearly 40 million and ranks as the fifth-largest economy in the world. If the Golden State follows through on the law, it will prove out the feasibility of a clean energy transition at a scale never before seen. "The victory is far more than symbolic," wrote Daniel Kammen, founding director of the Renewable and Appropriate Energy Laboratory at UC Berkeley, in an email. "Agenda-setting bills like SB 100 are both vitally important because they clarify other actions that the state is doing to meet its goals, and because they establish a framework against which we can measure our investment in the future." During the discussion period before the Assembly's floor vote, several Republican legislators expressed concern that the bill would drive up costs for electricity customers. Members also criticized how the state has privileged wind and solar power over other forms of generation. California's existing large hydropower or nuclear power plants, though they produce carbon-free electricity, do not qualify for the state's renewable portfolio standard laws, which incentivized new investments in wind and solar over the last decade. The new bill's requirement of zero-carbon resources, though, broadens the scope of what qualifies, leaving an opening for new technologies that may arise in the next 27 years.